Beautiful location, the grounds are amazing and fantastic views of the loch. Couldn't have asked for more. Fantastic stay as allways, looking forward to our next visit in April. Would highly recommend to anyone looking for a relexing break away. Incredible place to stay. So much character and charm, Loch-side views are simply stunning. Deneil is a perfect hostess and nothing is too much trouble. Great location for exploring all that The Highlands has to offer. Another two weeks of peace in beautiful surroundings. Lovely walks despite the weather fighting us. We never tire coming here as every day is different. Invergloy Riverside Lodges, the Perfect Higland Destination. Once again ,myself, partner & three golden retrievers had a wonderful stay at Invergloy Riverside Lodges. 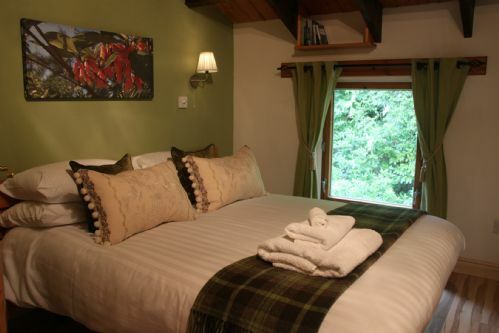 It's the perfect place to relax in the most stunning, tranquil setting overlooking the loch. The accomodation is first class & provides everything you could possibly need for a perfect stay. The King family go out of their way to ensure that you experience the perfect holiday retreat in the Highlands. Great lodge - everything needed was provided for. Everything in kitchen, comfortable beds, plenty of space. The gardens, play equipment, stream, lake, rope swings - meant the children good just go and play in a safe environment without disturbing others for as long as they wanted. We had a wonderful week in Cluanie Lodge. The location was amazing with great access to the loch and beautiful grounds. Very well appointed lodge with everything you could ask for. The indoor barbeque was fabulous. Deneil and her family made us feel very welcome and we would definitely be back if we visit the area again. Stunning location with the perfect lodging. Direct access onto Loch Lochy for paddle boarding, kayaking and not too far to Fort William. We were recommended this site and it did not disappoint. Very peaceful lots of wildlife. Good area to visit lots of places. Deneil and family were all very helpful and we will definitely return. Our dog had a great time in the woods and at the Loch. A great lodge in lovely grounds with a beach on the Loch. We had no problems and a very enjoyable stay. Great break with my dogs. Totally enjoyed my stay at Invergloy, the location is fantastic with a warm friendly welcome. Facilities are spotless and very comfortable, very quirky and unique with private beach and great peaceful setting. Wish we could stay forever. A truly gorgeous location. The children can play in the grounds for hours (we did have fabulous weather this year which helped). We always love coming to Riverside for the tranquility as well as being near to the mountains for walking. Deneil, Ian and family are fantastic hosts, nothing is too much trouble. We will be back. Everything was perfect and every person was so helpful and nice to us. We look forward to come back to Invergloy. We had the most amazing holiday with our 4 dogs. Deneil was so helpful and kind and was especially helpful with our very arthritic dog. The arrival gifts and fresh flowers were a lovely surprise. We have already recommended you to friends and we will definitely be visiting again next year. Thanks! Wonderful location with well equipped, warm and comfortable accommodation. Beautiful grounds by the side of the loch. Managed to fight our way through the snow to arrive to the wood burner lit in our cabin and a warm welcome from Deniel. Very dog friendly too. 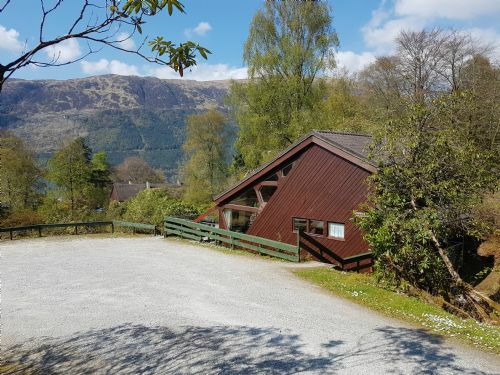 I booked Cluanie Lodge as a last minute getaway surprise in late February. It was truly above and beyond what the pictures portray. I’ll try and include as much information as possible. The lodge is beautifully built and perched amongst the woodland gardens - this means daily visits from birds and we were told deers, although we did not see them on this trip. The wood burner provided great heat so any cold that met us when we returned at night or woke up first thing was banished quickly. There are also electric heaters throughout which we had on for some extra warmth. The kitchen has everything you need to make meals - all the way from pots and pans to a garlic press and various Pyrex bowls etc. The fridge was perfectly sized for our 4 day stay. We only used the king bedroom which was very comfortable - the others looked well sized. The bathroom was a bit chilly but we didn’t make great use of the towel heater and they were cold days. The sofa gets s special mention for being very comfortable. The grounds of Invergloy are really special. You can see that great care and attention has been taken to think about small touches and many different spaces to explore. Each day we walked around we discovered something new and at night we were blown away just by sitting on the lodge terrace looking out to the reflection of the moon on the Loch with the snow capped mountain range behind. I’m sure next time we visit there will be more to explore. The location was ideal. It is set back from the main road and facing the Loch and mountains so the only sounds you can hear are the local wildlife, the nearby river and the Loch waves when it’s windy. It’s also a great spot to take driving adventures from. Over four days we went East to Loch Ness, Moray Firth and Cairngorms Park, South to Glen Nevis and Glen Coe, and North West to Skye. None of the journeys were too long for a day trip. Hosts - Deneil and her family were great. Deneil was always on hand to help with any queries and her family who live on the grounds were really lovely to chat to whenever we caught them whilst walking the grounds. Extras - we used the WiFi dongle that was on offer and the speed and connection was great for catching up on some work we needed to do and even streaming a few things. My O2 phone mostly had signal, my partners Vodafone was a bit more sporadic. I’d recommend bringing slippers if visiting in winter months. There are sweet baby hot water bottles provided in each room too. I would recommend staying here to anyone and we are already making plans to come back with family and friends - next time we’ll plan to spend more time at Invergloy. Thank you Deneil and the whole team for a beautiful stay. Stunning place to stay scenery was over gorgeous lodge was out this world cani beat the log fire. Dogs had a ball and made very welcome. Absolutely beautiful setting. The lodge was spotless on arrival, and Deneil could not have been more welcoming. We had a wonderful 4 day break, and will definitely be back, hopefully when the weather is a little drier. In summary, just book and enjoy. You will not regret it. 5 stars. The best lodge stay we've had so far. The lodges are lovely, with a perfect combination of modern and traditional touches. It's also very private,with only three lodges set in private grounds. The dog loved the loch, views were breathtaking and despite the capricious weather we fairly enjoyed our stay. 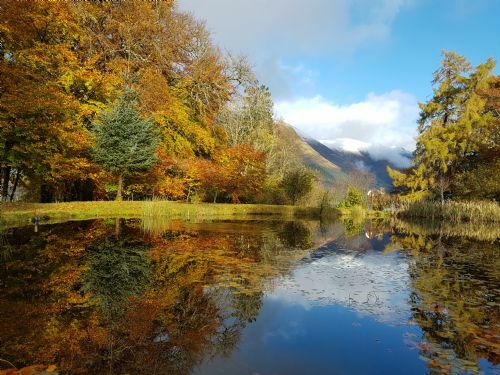 Location is also perfect if you want to visit Fort William, walk the Nevis Range or Glencoe. We'll be back and soon! This was our third stay at the wonderful Invergloy Riverside Lodges. The accomodation and location is first class. The family are friendly, helpful & welcoming, especially as we bring three Golden Retrievers with us. Just about to book our fourth visit. As always the lodge was clean, warm and welcoming. Janie John and family were welcoming and helpful. Lovely walks to be had in a beautiful part of the country. 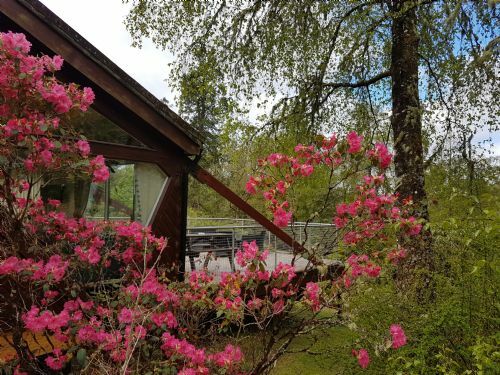 Great lodge in beautifully kept gardens, with direct access to Loch Lochy. Ideal starting place for exploring the highlands. Very friendly staff and a superb view from the lodge for relaxing holidays. Stunning location and gardens surrounding the lodge, Deneil and the King family are extremely welcoming and helpful. The lodges are comfortable and cosy and spaced far enough apart to feel private. We have been twice before and have loved every stay, couldn't recommend highly enough. The location of the lodge was fantastic. The lodge was well equipped. The interior of the lodge was a bit outdated. The fridge was a bit small for a family. We got a late cancellation for a couple of nights and it was just what we were looking for - a nice lodge to chill out in and relax. The facilities were excellent, the lodge clean, tidy and comfortable. We will definitely return for a repeat visit. Our 2nd visit to this fabulous location. Accommodation was excellent, location fantastic. Lots to do in the area but loch side views within the grounds of the lodge are amazing. Highly recommend a visit. wonderful stay at amazing lodge in a fantastic location, with a great host!!! stayed for 4 nights; just loved it. everything was perfect - couldn't have asked for better. view was wow, greenery around amazing - location was super. lodge itself was very comfortable, very spacious for 4 of us and very well equipped. host was very helpful and extremely nice. highly recommend to everyone, who is looking for accommodation in fort william area. Had a wonderful break with fantastic accommodation and facilities. Deneil and family couldn't have been more helpful. beautiful location,with lots of wildlife to see, even managed a spot of fishing.- Perfect! We hope to be back sometime in the future. Overall,an enjoyable stay. However,the potential cost to replace customised crockery was ridiculous. No useful bottle opener. Tiny bedroom and huge bed.I couldn't actually walk around it,had to shuffle sideways. Outdoor patio needs work and we felt the table needed sanding and re coating,we used one of our towels as a cloth. Luxury accommodation? Far below. Enjoyed another lovely stay at Riverside, spent two weeks this time, lodges up to the usual standard, had a fabulous time! The cottage was very clean, well appointed and located great for trips to many scottish attractions. The owners are very friendly and helped us with every question. A nice place to relax in the nature. It was a fantastic time. A very confortable lodge set in a beautiful countryside. The customer service é muito eficiente. The Lodge was excellent. 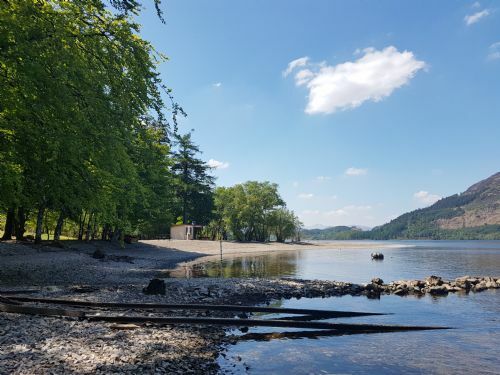 It's situated in an absolutely beautiful part of Scotland with an amazing view over Loch Lochy which is 2 minutes walk from the door. Staff at Invergloy were very welcoming, helpful and approachable. All in all it was utterly fantastic. We will be back. Thank you to Deneil and family for making our recent stay at Riverside Lodges - Invergloy a wonderful (surprise) family break together. The changes/decor of the lodges and grounds (we stayed here previously 10 years ago), gave the lodges a wonderful homely feel and the lodges themselves are so comfortable and warm with the new log burners. It was a pleasure to walk around the acres of grounds at this time of year (Oct 2016) and of course we were truly blessed with the weather - which enabled us to use the private beach on the Loch (even my son took a swim in the loch), have a BBQ and make full use of the new Otters Hut. Being dog friendly meant we could enjoy having the 'whole' family with us on this holiday. Max just loved his walks, time on the beach, along the gorge and in the woods. Apologies we forgot to write in the visitors book for Cluanie Lodge, please feel free to copy and paste these comments from the Fleming family in the book in the lodge. Lovely lodge in a beautifully tranquil setting. Perfect for a relaxing getaway, also very child and pet friendly. Fantastic customer service. Hope we can visit again. First time staying at Cluanie Lodge and we loved every minute of it. I have already recommended it to friends and family. The effort and detail that has gone into making sure guests (no matter what age & also the four legged guests) enjoy their stay is wonderful. From the well equipped lodge to the beautiful garden walks and riverside BBQ area - it was just breath-taking to say the least. Well done Deneil ,the owners and all who play their part in the upkeep - you have a truly magical place to allow other to share in. Lodges in a beautiful setting, lovely hosts and peaceful place. Everything that's needed to recharge your batteries. Plenty of walks around to enjoy or the beach to sit and watch the world go by. Fantastic place in afantastic setting. Everything was fine for us. The location is excellent and the setting is great. Really good access to the Nevis Range and Glen Gloy nearby was a desolated surprise. The lodge was extremely clean with really comfortable beds. Garden birds visited the balcony every day. The grounds are really well maintained. We brought our wetsuits which were put to use in the loch and in the river. been visiting these lodges for four years now, what a fantastic location,cant beat it,owners cant do enough for you and make you very welcome,as a fisherman you could not have a better base with so many places to cast a rod close to hand.the lodges are so comfy and clean and tidy, i really could not fault them,will be going back again for the next few years,my opinion is if you are into any outdoor activities this is the place to book 100 per cent. Had a great week at this fantastic accommodation. Great location and was simply brilliant. Would highly recommend. Lodge was super and had all home comforts surrounded by lovely gardens. We keep coming back, this was our third year running! Lovely location, perfect for free range kids. Deneil and family always make us incredibly welcome. Very nice place to stay, in the middle of a wonderful garden facing mountains and loch. Very easy access to many walks around the lodge, and a nice place to rest after a walking day. I had excellent communication throughout booking and sorting, easy transaction, warm welcome on arrival with fire burning away and complimentary wine and chocolate, immaculate and well presented, fresh towels and clean linen - always a vital point in my book! very friendly on arrival. Would def recommend. Our first stay in the Highlands. Having recently retired and always wanting to visit the Highlands, we decided to stay at Invergloy Lodges largely based on the fact that friends, who like us had large dogs, returned there year after year. We are now totally smitten with the place! The location is simply superb, the Lodge was immaculate, well equipped and ideal for our needs. The hospitality and friendliness extended to us by the owners was wonderful, with nothing being too much trouble. We are already planning to return there next year. The only suggestion for improvement would be more storage space for clothes in the second bedroom. I have stayed at Invergloy Lodges on a couple of occasions and have found the owners to be very friendly and attentive. The lodges are in one of the best locations that I have ever stayed at in Scotland ( I have been coming for over 20 years ). Both the grounds and loch side, in particular, are stunning. Even my teenage son is taken by the beauty of it. However, I do feel that the lodges are a little cramped for 6 adults and there is not enough storage space within the smaller room upstairs. Having said that, it did not affect our enjoyment of the lodge and the grounds. I will continue to recommend this lodge as a fantastic place to stay when visiting Scotland. Warm welcome given on arrival from Deneil. Lovely touch of welcome basket with local treats even a biscuit for the dog. Family always on hand if anything extra required. A beautiful place with friendly owners. I recommend it to anyone who is visiting the Highlands. We had a wonderful stay at Invergloy Cluanie Lodge. The area surrounding the place is very quite and in less than 2 minutes walk is Lake Lochy with beautiful scenery of the mountains. The place is clean and the owners were very kind, helpful and friendly. Riverside Lodges are a perfect place to relax. They sit in beautiful gardens with stunning views. Plenty of yummy eating places and then lovely walks to work it all off. The welcome on arrival is always warm and very welcoming. The lodge itself is comfortable with everything that's required, the refurbishment is stunning and the log burner is just soo cosy. Autumn is a stunning array of colours from the gardens. Invergloy Riverside Lodges provide a perfect place to relax and touring the beautiful area the lodges are placed within. 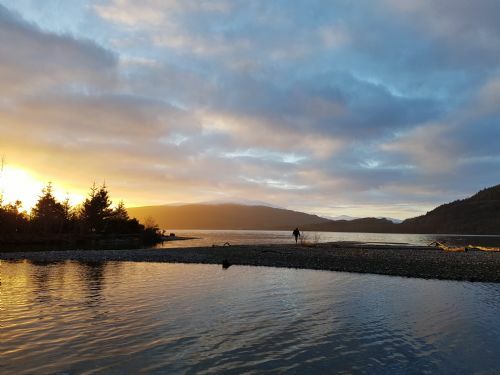 The ground, the direct access to Loch Lochy and the option to explore it all on foot gave us the feeling of freedom and quietness. A place, we will surely return to in the future.